REWIND-A-SMACKDOWN 2/6/18: Top 10 List, Owens vs Zayn, 205 Live is… Great? 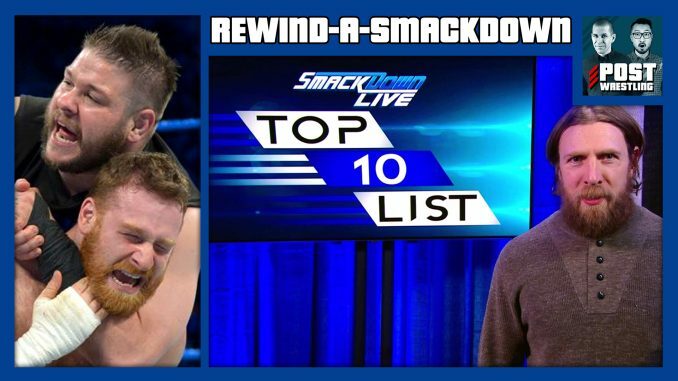 SmackDown’s Top 10 List has many confused, Owens vs Zayn results in a three-way at Fastlane, The Uso’s cut another great promo, Charlotte takes out the Riott Squad one by one, Shane McMahon makes a heated accusation against Daniel Bryan. The Mixed Match Challenge sees Naomi/Jimmy Uso take on Goldust/Mandy Rose (“RoseGold”). And the newly-revamped 205 Live continues to steal Tuesday nights with Hideo Itami vs Roderick Strong and Lince Dorado vs Kalisto. We also discuss Jason Jordan’s neck surgery and a preview of this weekend’s NJPW New Beginning in Osaka card.